I’ve been hooked on fishing since I can remember catching my first fish, a slimy mackerel on a hand line. It’s pretty much been an obsession since then, I would read every book, magazine, newspaper and tv program I could find and even joined the old Rex Hunt junior angler membership. I grew up enjoying mostly beach fishing an hour south of Perth with the main fare being tailor, herring and whiting with the yearly salmon run being my favourite time of year. I also lived nearby a dam which I would throw lures for Redfin perch and also a small stream that ran through my grandfathers property for wild rainbow trout. That’s where an addiction for lure fishing started. My aim is to continue to push myself to become a better more consistent angler, qualify for the national Kayak championship and beat my previous best result. Also to continue a good year in the boat scene and see if my team can finish ahead of our top 5 position. The purchase of my first kayak opened a new world of opportunity from being a land based Fisho my whole life and pretty much what started my bream fishing addiction. 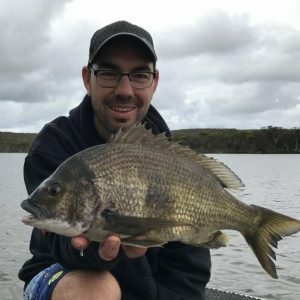 Floating silently along the river casting lures into crazy looking snags in the hope of landing that trophy bream ticked all the right boxes for me. Since then it’s been a series of firsts, first 40cm bream, first comp win, qualifying for the national championship, to getting sponsored and representing a quality company all some of my highlights. I’ve had the opportunity to travel the country doing what I love, meeting people along the way, learning new techniques, adapting to different styles and helping new comers that remind me of myself when I started trying to give back what the sport has given me.